As a child growing up in Cleveland, Ohio, USA, wild edible plants — especially those we foraged for ourselves — were never on the menu. Sure, we picked blackberries on late summer hikes and a few times I tried harvesting Staghorn sumac berries to make my own tea. But otherwise, the food on our dinner table came straight out of a supermarket. So it’s hard to believe that, these days, wild edible plants comprise at least half or more of the stir-fried dishes that leave my mother-in-law’s kitchen here in China. Even stranger to me, I’ve actually helped forage for some of these wild edible plants. To think that something I harvested actually became dinner! Now that I’ve discovered the joys of harvesting and dining on wild edible plants, I can’t imagine life — or lunch — without them. 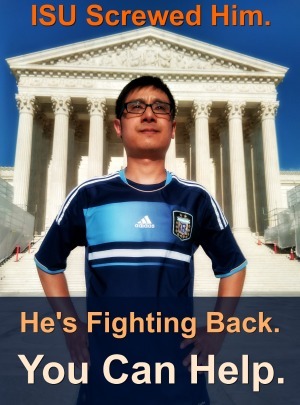 Call it yet another one of those surprising things I’ve learned from living with a Chinese family in the countryside. Here are three amazing wild edible plants here in Zhejiang, China that have enchanted me and my Chinese family this Spring. These tender fronds have become a Spring favorite in farmers markets in the US (and among foragers who know and love them). 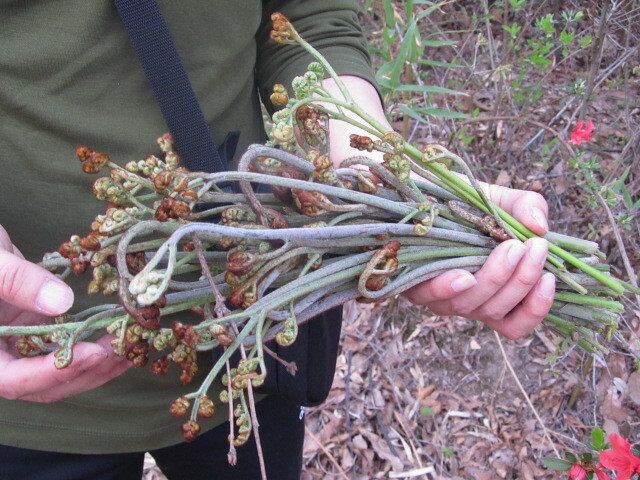 But out here in rural Zhejiang, people have gathered fiddlehead ferns in the mountains for generations. The local variety is the bracken fern and the tender shoots spring up over the mountains in our village. Some claim bracken fern is carcinogenic, though there’s really no absolute evidence proving that the consumption of bracken fern fiddleheads will definitely give you cancer. When I posed this “do bracken fern fiddleheads cause cancer?” question to my mother-in-law, she dismissed it as unscientific and ridiculous. “People here have been eating this for generations, even grandma, and they’re not getting cancer.” Well, even if you disagree, remember that some popular foods (red meat and hot dogs, anyone?) are considered carcinogenic. Personally, I think I’ll take the risk. My mother-in-law washes them thoroughly in her kitchen and then blanches them. Some claim the process reduces the carcinogens in the fern, though my mother-in-law says this simply eliminates the unpleasant sour, “numbing” flavor of the fiddleheads. Finally, she chops them into matchstick-sized pieces and stir-fries them with fragrant garlic, ginger, pickled hot peppers, Shaoxing wine, and salt. So tasty, you’ll forget all about the alleged cancer claims. Promise! The Chinese saying “like spring bamboo shoots after rain” (yǔhòuchūnsǔn, 雨后春笋) refers to how quickly things can suddenly happen or come up. 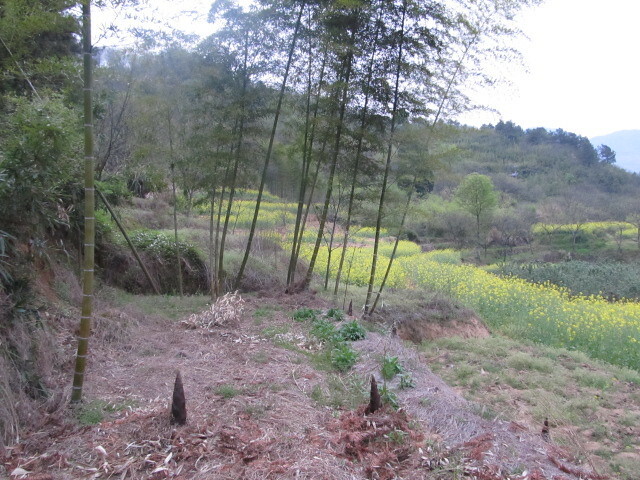 And trust me, after the rains in late February and March settled over our region of Zhejiang, before I knew it spring bamboo shoots were sprouting all over the hills. 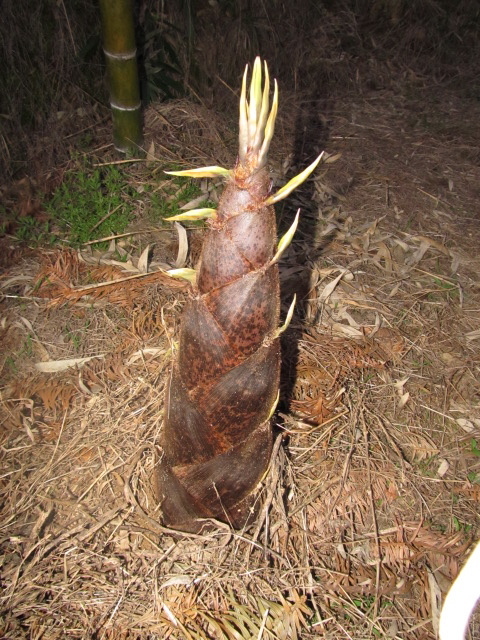 Notice the bamboo shoots sprouting up from the ground? Right now, we’re seeing two varieties in the mountains. One is moso bamboo shoots or maosun (máosǔn, 毛笋); this is the largest variety of bamboo you usually see in the area. If you’ve ever watched any Chinese films that feature bamboo forests, chances are they’re moso bamboo. The other, well, I have no idea what it’s called in English — but it’s small and grows wild all across the mountains, so in the local language they call it “mountain bamboo shoots” or shansun (shānsǔn, 山笋). To harvest either variety, you simply dig up the shoots from the ground. 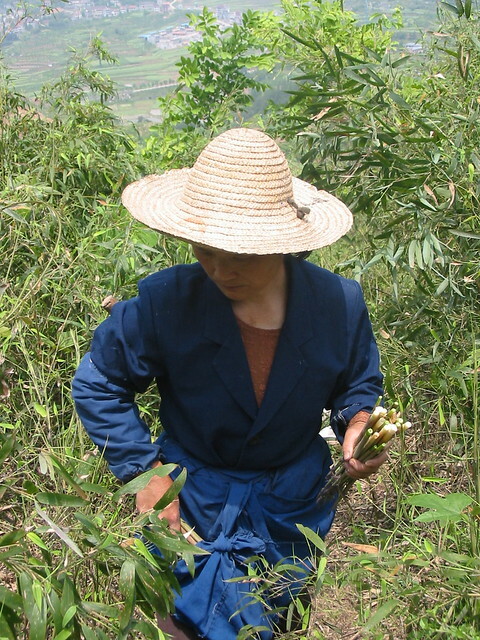 My mother-in-law, harvesting shansun from the mountains. Whether maosun or shansun, you must first peel away the hard husk of the bamboo shoots to reveal the tender and edible portion. Peeling the bamboo shoots to reveal the tender and edible part of the shoots. 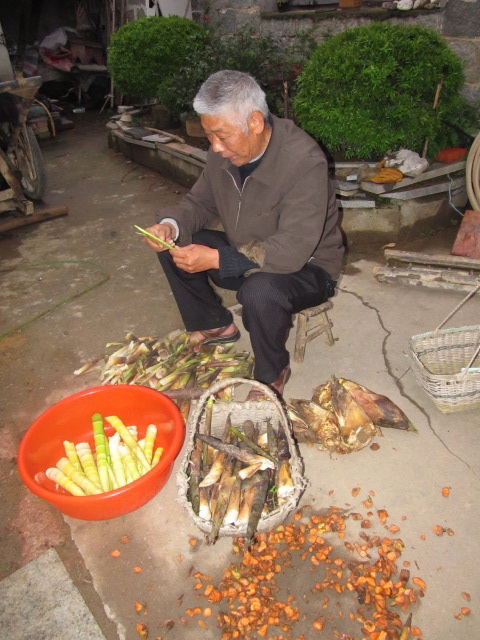 These days, when it comes to wild bamboo, we’ve mainly seen wild maosun at the table. My mother-in-law usually prepares it one of two ways. For the vegetarians in the family (i.e., me! 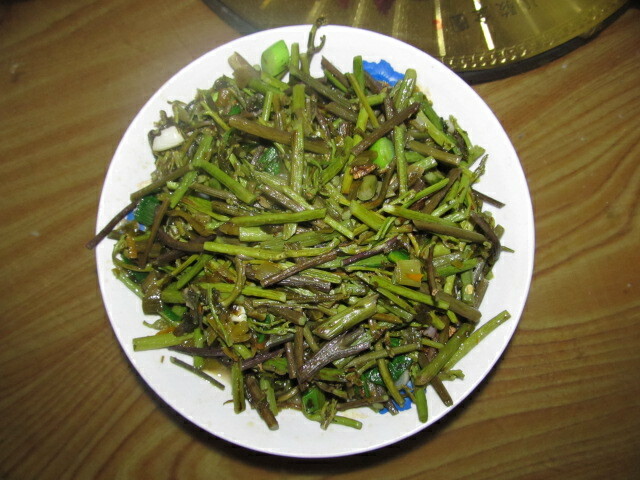 ), she stir-fries it with lots of rapeseed oil, ginger, sugar, Shaoxing wine, soy sauce, pickled greens, and salt to taste. 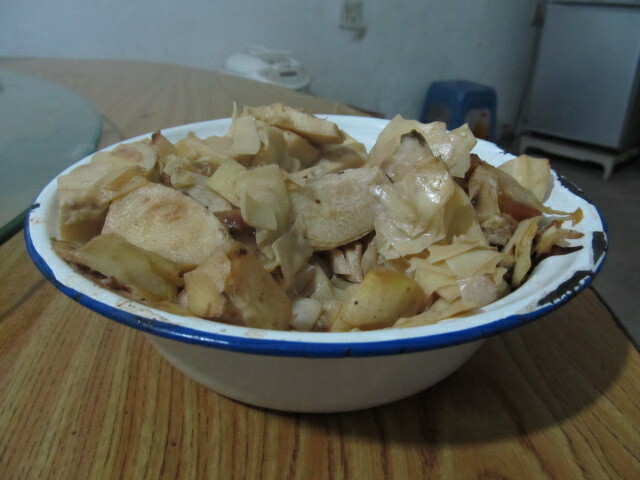 For the carnivores, she stews the maosun along with fatty pork, ginger, sugar, Shaoxing wine and salt to taste. If you’ve only known bamboo through the lackluster canned versions sold in the West, all you need is one taste some wild bamboo shoots and I promise, you’ll never buy another can again! This past Saturday (April 5) we just celebrated Qingming Jie (qīngmíngjié, 清明节) or the Tomb-Sweeping Festival where people visit their ancestors graves and remember family and love ones who have passed away. 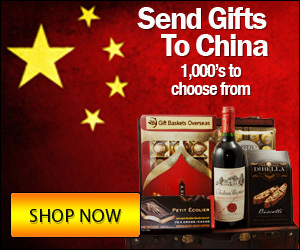 And here in rural Zhejiang Province, there’s no wild plant more beloved during this holiday than the aromatic mugwort, also known as qingmingcao. 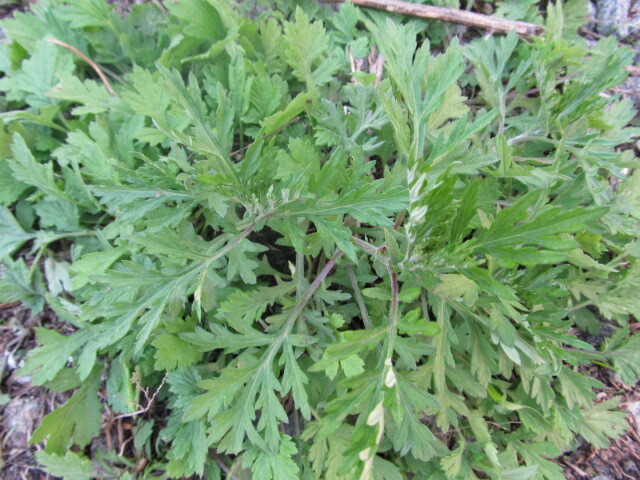 It’s hard to believe just how common this variety of mugwort is around here. In fact, it grows like a weed everywhere, even in the dusty pebble lanes that criss-cross the fields in the village. For nearly two weeks, I hiked these lanes, never realizing all that time that mugwort was right under my shoes! My mother-in-law gathers wild mugwort from the hills well in advance of the holiday, because this lowly little wild green undergoes an extraordinary transformation in the kitchen. After cleaning it, she blanches it and then crushes and grinds it into a paste, infusing the kitchen with an aroma reminiscent of lavender. 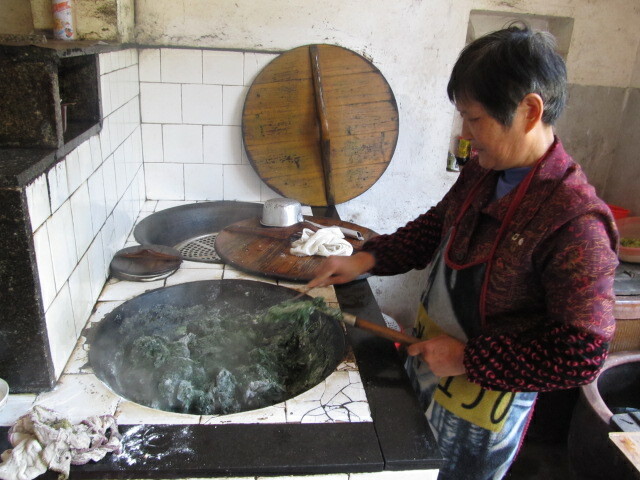 The paste then goes into a warm wok along with glutinous rice flour, creating a dark green dough. 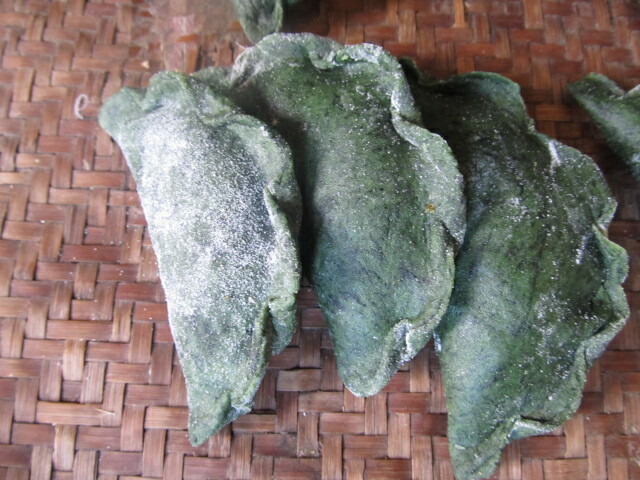 That dough then gets kneaded and partitioned into small rounds, which after being flattened, become the wrappers for qingming turnovers (stuffed with chopped up bamboo shoots, tofu, and salted greens). 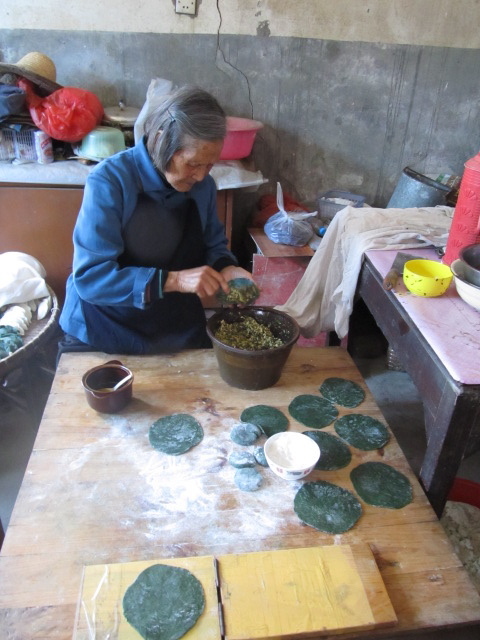 Making the qingming turnovers (flattening the rounds, then filling them with vegetable filling). The finished qingming turnover up close. 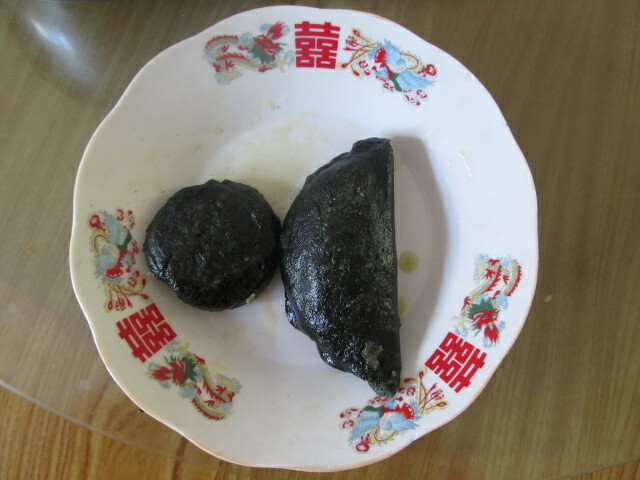 For a sweet version, my mother-in-law adds sugar to taste to the green dough and then shapes the rounds in a small mold made especially for Qingming Jie. Finally, she steams the turnovers and sweet rounds in her wok until they’re cooked through and turn a deeper shade of green. Here’s the final product (one turnover, one sweet round) — slightly fragrant, sticky, and oh-so scrumptious. Remembering your ancestors never tasted so good! Have you ever foraged for wild edible plants? What are your Spring favorites? We went to some villages around Zhenjiang and Danyang (in Jiangsu province) for Qingming and my boyfriend’s mum and aunts were like crazy picking herbs. Now I know it was mugwort! Thanks, Jocelyn! haha. When I was a child in Spain I remember going some times to pick some kind of wild potatoes in the countryside. I don’t know what it was, we called it “truffles”. I also went some time to pick wild mushrooms in the north of Spain. But it was definitely not an every day activity! That’s cool you picked wild potatoes and mushrooms in Spain! Have tried fresh bamboo shoots. Depending on how it is cooked, fresh bamboo shots taste wonderful and crunchy to the bite. 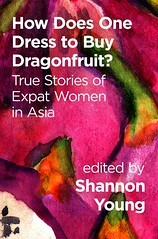 I love reading about your life in China! It sounds quite amazing that you can go out and pick wild plants. I can only imagine how fresh, delicious, and healthy they are! 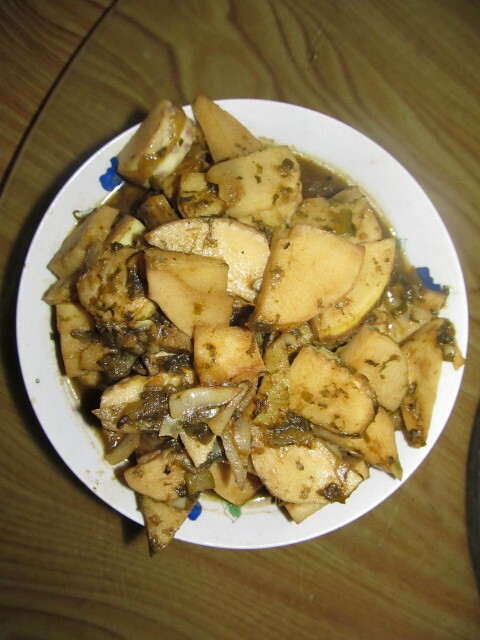 I love bamboo shoots and have eaten them on countless occasions. 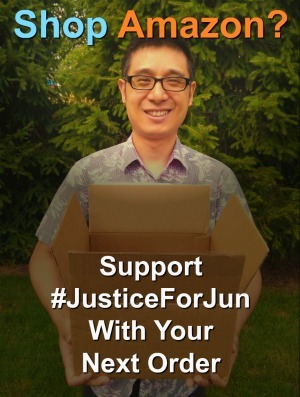 My husband’s family usually wraps them and barbeques them on Moon Festival. Wow, barbequed bamboo sounds so tasty! I wish I could try that! I highly suggest you do! It tastes very good!! This is such a good article! The photos and your explanations make the whole process, from foraging to eating, perfectly understandable. I didn’t know what mugwort looked like before. In the mountains around here (Washington state) people forage for morel mushrooms. They aren’t easy to find, and you have to know what you’re doing. There are so many poisonous varieties of mushrooms. Although I haven’t foraged for morels, some friends have. They’re to die for. Canned bamboo shoots are disgusting, but I love the fresh ones. Oh, morels are such a delicacy, that would be incredible for forage for those. But yes, it is tough to forage for mushrooms, you really have to know what you’re picking. I’m wish you, canned bamboo is disgusting indeed! These dishes look so yummpy. What a good life to live in the place where you can pick so many wild plants easily. I thoroughly enjoyed this! thanks for all the details and the pictures. 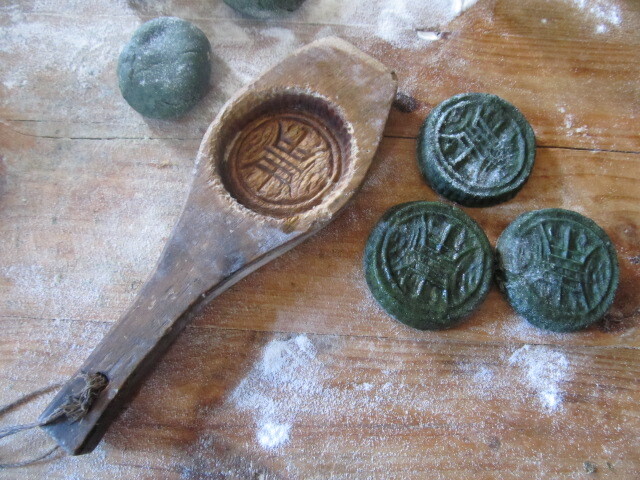 The mugwort dumplings and rounds look amazing. What a colour! I grew up in the countryside and in spring we used to forage for wild young dandelion and poppy plants, boil or steam them (dandelion is better boiled as the leaves are rather bitter) and then dress them with olive oil and salt, or saute them with oil and garlic. There were a couple of other plants, of which we ate the tendrils, and some mushrooms, too, but I only know the local names. Wow, you foraged for wild dandelion, poppy plants and mushrooms? That’s really cool, Paola. Mmmm, your description of preparing the plants made me hungry! Unfortunately, none of my family members ever foraged for anything. In Russia, a popular pastime is collecting mushrooms, but because my parents couldn’t tell the difference between various mushrooms, my sister and I never picked any. I recall on my late grandmother’s vacation house, (dacha) she had a lot of plants and fruits growing there. I recall that I loved kicking mushrooms when I was a kid haha, especially after rainy days. Thanks for the comment, Sveta! It’s always interesting to read about your memories of life in Russia. Using wild edible plants for cooking has become popular in Europe in recent years – a pioneer of this “movement” was the chef of Noma, an award-winning restaurant in Danmark (it’s sometimes dubbed Europe’s best restaurant). We didn’t use a lot of wild edible plants when growing up – we ate wild strawberries or other berries from the forrest and used fresh dandelion leaves to make salads (you’ll have to put them into water for a while so it won’t taste as bitter). 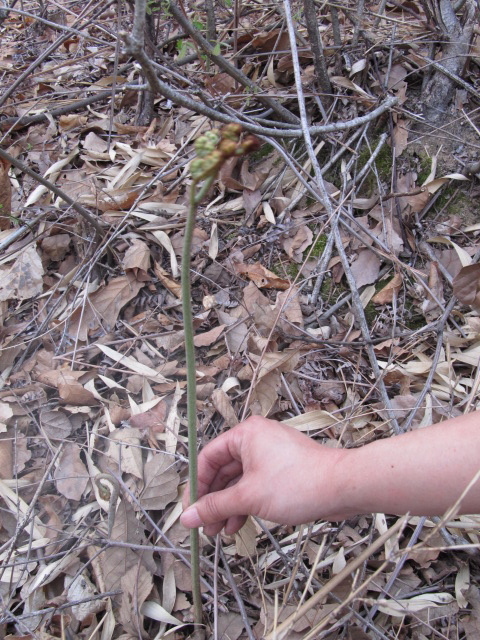 It’s common to go hunting for bear’s garlic in spring in Austria, but you have to be very careful because it’s easy to mistake it for another plant which is poisenous (and every year there are a few cases where people have to be treated in hospital because they ate the wrong kind). I agree, bamboo shoots are great fresh and oh so bad when canned. Unfortunately, most (inauthentic) Chinese restaurants in Austria use canned bamboo shoots for each and every dish, meaning those dishes all taste the same and not delicious at all. Fascinating hearing about your experiences in Austria, R! I have heard of Noma — saw it featured on a travel show about Europe and the restaurant did indeed look amazing. Yeah, it’s the same in the US, the inauthentic Chinese restaurants all use the canned versions. Ugh! Sorry, meant to write Denmark. Jocelyn, I love your tasty offering. Vince, I don’t know if there is wild taro root here, though people do plant it in their gardens (and harvest it later in the year, I think in the summer). One doesn’t need to be in the countryside to enjoy fresh wild herbs. Here in downtown Beijing some of my older neighbours pick /xiāngchūn/Chinese toon leaves and dandelion (蒲公英/púgōngyīng) – and those are only the two I know about, there are quite possibly others. Naturally, they need to be washed thoroughly to get the urban filth off (Jocelyn, treasure the “clean dirt” (as we call it in New Zealand) you have out where you live). I’m not sure about the Chinese toon, and I’m not a great fan of it, although it is alright stir fried in egg, but one of my neighbours explained to me last week the medicinal properties of the dandelion leaves. And then, of course, I immediately went and forgot what those medicinal properties are. 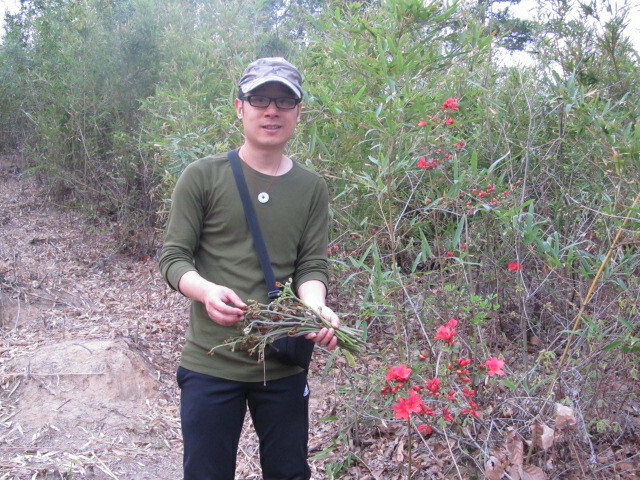 Nice that your neighbors pick wild herbs even in Beijing! Though yes, I would imagine the “urban filth” you mention would be a concern for sure. I’m mad jelly that your husband’s family lives in the countryside! 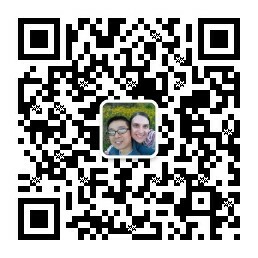 It definitely seems like a more authentic (and healthy) lifestyle than the one you get in Chinese cities.